Town officials on Tuesday unanimously approved two items related to a proposed new barn at New Canaan Nature Center whose occupants will include four donkeys. The Board of Selectmen voted 3-0 on a pair of proposals, for the construction of the barn itself in Bliss Park as well as the merger of two parcels there into a single lot—a technical land use concern since the new structure will straddle them. Asked by the selectmen whether the animals currently live in a similar structure, Flynn said yes. First Selectman Kevin Moynihan and Selectmen Kit Devereaux and Nick Williams voted in favor of the project. 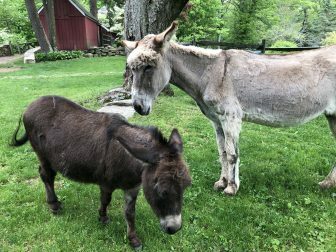 A private New Canaan citizen who has the donkeys on her property is donating them, since she’s moving and they require a new home. She also has offered to donate funds required to build their facilities. The four donkeys will live with two Nigerian horse goats and six chickens already at the Nature Center’s mini-farm. The goats, in fact, will live side-by-side with the donkeys in the barn. The current farm animal facilities—chicken coop with a run, storage shed, paddock and goat pen—will be replaced, Flynn said. “The money to build it has already been promised, the upkeep of the animals included, so it is a no-brainer,” he said. The selectmen asked what would be the size of the barn (54 feet long, 33 wide and 19 tall), whether it would include electricity (yes, and water but no HVAC) and whether the new barn’s upkeep would be paid for out of the Nature Center’s own operating budget (yes). The donated animals are expected to bring a number of benefits to the farm, such as offering a new attraction to visitors as well as potentially broadening the field of equine therapy offered by the Nature Center. 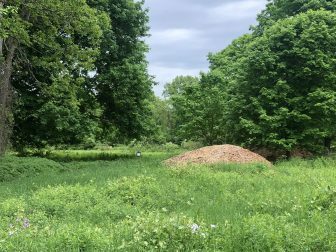 It will be located to the east of the apple orchard at the Nature Center in what is currently an overgrown field that can double as a grazing area. “Public works will no longer have to come in to cut the field because donkeys will do it,” Flynn added with a smile and nod to Public Works Director Tiger Mann, a guest at the meeting. The last Nature Center agreement outlined with the town was signed in 1970, and it lacked detail regarding who would pay for what, officials said. Williams sought further information regarding the barn’s upkeep. “The biggest cost would be a roof somewhere down the line, but because this will be a brand new barn I’m not expecting those expenses for a few years,” Flynn said. The proposed location of the barn straddles two technically separate parcels in the park—they had been donated at different times—property that’s owned by the town and operated by the Nature Center. On the recommendation of interim Town Planner Keisha Fink, the selectmen voted to join them as a single parcel. “The only reason this issue came up is that we ingeniously picked a location right between that property line,” Flynn said. Final approvals from Planning & Zoning, Inland Wetlands, Health Department and Town Council are needed. The New Canaan Nature Center expects that the barn construction would be complete in late summer to early fall. Are these the wonderful and friendly donkeys from the beautiful farm on North Wilton Road and Bald Hill? We have enjoyed them for many years – so happy to know they will have a home at the Nature Center – so we can still visit them!